I recently got a 2010 Camaro with 34K miles. There is a front end noise that I noticed when I turn the wheel while the car is moving. I have heard that there is a known clunk noise that can be caused by the strut bushing design. I can be barely moving when I hear the noise in my car which leads me to believe it may be someplace in the steering. I have checked and the shop that did an alignment also checked and we can find no visibly loose or worn parts. Anyone had a similar problem and perhaps a fix. I don't want to depress you guys but this noise is a by-product of the upper strut mount design and is not fixable by simply changing a strut or strut mount. Unlike most strut vehicles with bolt-in upper strut mounts, the Zeta platform uses a floating upper mount. The mount literally just sits in place using the weight of the car to hold it there. Those funny looking formed washers in the engine bay that stick up 1/2" above the strut towers are the strut retainers. If they were not there, the struts would literally fall out if you jacked the car up. What happens when you go over bumps, washboards, potholes, etc. is that the strut rebound valving does not allow the strut to extend quickly enough to compensate so the entire strut assembly falls down out of the strut tower slightly. This creates the noise everyone is hearing. It is not dangerous by any means but it is definitely annoying. Ultimately the design itself needs to be changed or the problem will continue. 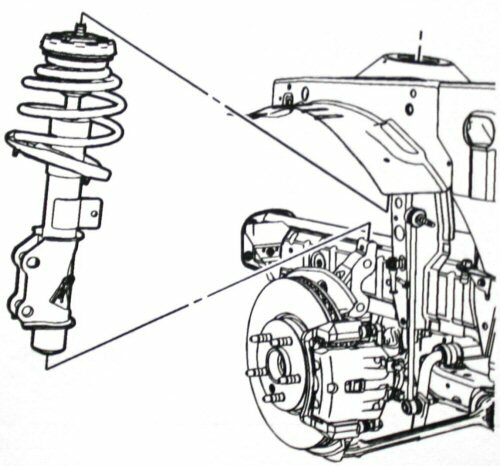 This would have to include changing the design of the strut tower itself as well as the strut mount. I doubt GM will do any more major re-designs with the Zeta platform but hopefully this issue will be resolved with the upcoming Alpha platformed Camaros. Keep in mind this is a completely different issue from the earlier upper spring isolator service bulletins. The issue being discussed generally only happens while driving over speed bumps, transitions, rough pavement, etc. The reason I believe it may not be the strut assembly design is that the noise can occur when I turn the steering wheel and the car is barely in motion. At this point there hardly is any movement of the struts so why would the noise be coming from them. My guess is that it may have something to do with the steering components. Is there a "felt" response when the bump occurs, i.e. in the steering wheel? Have you checked to see if GM has a recall on issues in the steering/suspension? Our 2011 Tahoe had a similar noise/felt response and GM had a recall on it. I give that a look. Was moving the car in the garage this morning when the weather has been cold. Without the car even moving when I turned the steering I could hear the clunk. It is less noticeable when the car or the outside temperature is warmer. Looks like I will eventually be checking all the steering components to find the source of the noise and figuring out what parts need to be replaced. Well finally got enough work done on my Custom Camaro (Nomaro) so I could start driving it around. While trying to diagnose the front end noise problem by myself I found it has been a real challenge. I have done a lot of searching and read a number of articles about potential front end noise problems with the 5th Gen Camaro's but no real solutions. One that made some sense was the sway bar links. They are inexpensive so I changed them. Still had the noise. Next I wanted to verify if the intermediate shaft or possibly the struts were my problem. I finally got a friend to lay under the car while I turned the wheels. Lots of checking and feeling for vibration but nothing definite until he spotted the rack move slightly. We did it a couple more times and found one of the rack mounting bolts was loose. A long extension with an 18mm socket and my problem of several months was fixed in less than a minute. I also checked the other 4 bolts and they were nice and tight. Been driving it around and happy to say there is no more loud clunking noise in the front end. Last edited by Rmay; 08-18-2017 at 01:48 PM.